This free ESL lesson plan is the final in our series on The mind. It contains activities, games and other teaching resources that focus on conversation skills for Advanced English students. See activity 2 for detailed instructions on this board work. The students report on their homework assignment from the previous lesson. If you have done lesson 2 for this unit and gave out the homework, there are a couple of ways that you could review the homework in the classroom. 1. Invite the students to summarise their essays one at a time. Ask each a few questions, then open it out to the group for a discussion. You'll find that by the last person, most ideas have already been brought up. 2. The students read a partner's work and then summarise it as part of a group discussion. 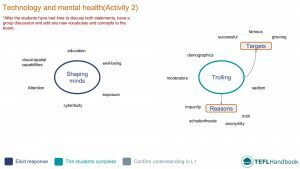 Your students will discuss statements related to technology and mental health. 1. How is technology shaping the minds of today's youth? 2. 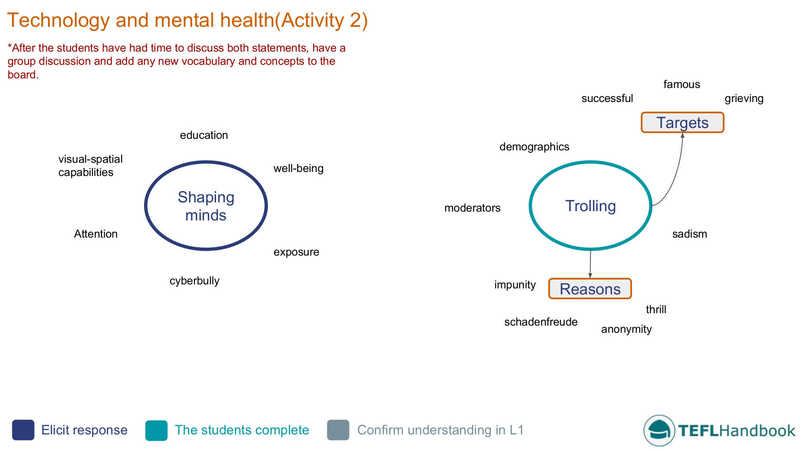 Internet trolling: A minor grievance or significant problem? Give the students some time to discuss these among themselves before holding a group discussion. During the talk, add any new ideas and vocabulary to the board (See the sample board work for this lesson). A tech company has invented a technology that will expose the identities of all anonymous online trolls. Before the company goes live with the product, the European Commission president (you) must sign-off on the legality of such a technology. You will hear arguments for and against a ban on this software. Divide the class into two sides and assign each to a side of the debate. Give them 5-10 minutes prepare their arguments. If they have access to the internet and smartphones, they can research the topic online. You will chair the debates and make sure that everyone has had a chance to say their piece, and also respond to any counter-arguments. As the president, you'll have to decide at the end. Base your decision on how each side performed in the debate. You should justify your choices. In teams, students will work through a list of idiomatic expressions and try to compose definitions. Start by dividing the class into two teams. Then tell your students that you are going to write a list of expressions on the board and that they must attempt to write a definition for each one. When counting the scores at the end, the team with the closest interpretation wins the point. 3. A harebrained idea: A foolish or impractical idea. 4. Off your rocker: Completely crazy. 5. Come to grips with Sth: Start to understand or deal with it properly. 7. Sharp cookie: Someone who is not easily deceived or fooled. If you found these resources helpful, our next free lesson plan in this course is on linking devices. Also, be sure to check out our full list of advanced ESL lesson plans. For other levels, have a look at our complete selection of EFL - ESL lesson plans.